This ever so pretty natural Amethyst Lace Agate gemstone has an elegant lavender color accented with darker shades of purple and a unique small speck of brown. 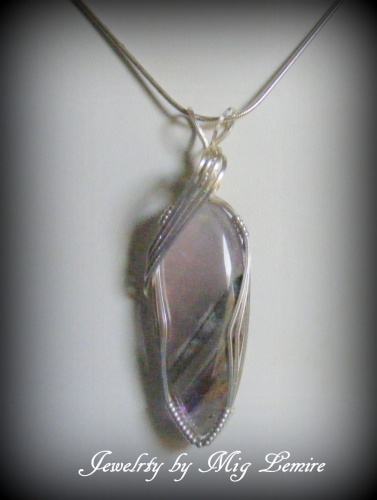 Truly one of a kind and so classy looking with its sterling silver framework and the pretty and not too overpowering swoop on the front top of gemstone. This piece measures 2 1/4" from top of the bail to the bottom of the gemstone and 1/2" wide. Comes with a sterling silver snakechain.